New York gold futures rallied on Thursday, gaining for a second straight day despite a stronger dollar and tumbling two-month low oil prices. Like a broken record, European Union debt concerns were given credit for driving money toward safe-haven investments, like gold. U.S. stocks were pummeled, with the Dow falling for its biggest intraday day drop ever. The aforementioned euro zone debt worries was a cited catalyst for losses, as well as a potentially erroneous trade or trades that had a massive sell-off effect. Gold for June delivery surged $22.30, or 1.9 percent, to $1,197.30 an ounce. It ranged from $1,173.00 to $1,198.00. Silver for July delivery lost 1.9 cents, or 0.1 percent, to $17.515 an ounce. It ranged from $17.315 to $17.775. July platinum gained $16.90, or 1.0 percent, to $1,666.50 an ounce. It ranged from $1,652.90 to $1,688.00. June palladium rose $5.55, or 1.1 percent, to $514.10 an ounce. It ranged from $502.50 to $517.70. "We like owning gold and expect further upside as sovereign risks intensify and real [interest] rates remain anchored," analysts at J.P. Morgan said in a report Wednesday that was cited on MarketWatch. "[W]e believe that the market is underestimating secular risks … Growing sovereign risk is lifting our appetite for gold." "This is a classic capitulation day," Kevin Davitt, a senior market strategist at LaSalle Futures Group in Chicago, said on Bloomberg. "There is a pervasive fear and movement into gold as a safe haven." In PM London bullion, the benchmark gold price was fixed earlier in the North American day to $1,185.25 an ounce, advancing $20.25 from Wednesday. Silver rose 6 cents to $17.690 an ounce. Platinum settled at $1,662.00 an ounce, rising $26.00. Palladium ended up $14.00 to $507.00 an ounce. In related coin bullion news, rising gold prices appear to have increased the demand for United States Mint gold coins. 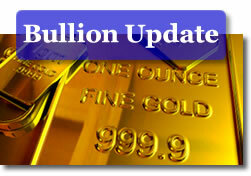 For more, read the CoinNews article Gold Coins Jump as Gold Prices Hit 2010 Highs. Crude oil tumbled for a third day, "as concerns that the Greek debt crisis could engulf other euro zone economies fueled worries about demand for oil," reported Robert Gibbons of Reuters. "The oil market is being hit by a double whammy," Jason Schenker, president of Prestige Economics LLC, an Austin, Texas-based energy consultant, said via Bloomberg BusinessWeek. "The rise in the dollar is pummeling crude. Also, there are global growth concerns which have increased because of the credit downgrades in Europe and the Greek debt crisis." New York crude oil for June delivery fell $2.86, or 3.6 percent, to $77.11 a barrel. Oil declined $2.77 on Wednesday and $3.45 on Tuesday. However, the national average for regular unleaded gasoline rose 1.0 cents to $2.929 a gallon, according to AAA fuel data. The current average is 5.2 cents higher than last week, 9.9 cents more than a month back, and 81.9 cents higher than the average from a year ago. U.S. stocks fell. "In one of the most gut-wrenching hours in Wall Street history, the Dow plunged almost 1,000 points Thursday, before recovering some, on a technical glitch in the trading of Procter & Gamble stock and fears about the European debt crisis spreading," wrote Alexandra Twin of CNNMoney.com. "The panic in the middle of the day was market makers that just disappeared, and every machine on Wall Street was trying to sell into a market that didn’t exist. That was a bizarre electronic quant panic of people selling into a black hole," Peter Boockvar, equity strategist at Miller Tabak, said on MarketWatch. The Dow Jones industrial average plunged 347.80 points, or 3.20 percent, to 10,520.32. The S&P 500 Index declined 37.75 points, or 3.24 percent, to 1,128.15. The Nasdaq Composite Index retreated 82.65 points, or 3.44 percent, to 2,319.64.
by Jon Nadler, Kitco Metals Inc.
Gold Bug, Or Gold Bugatti? Gold prices recovered nicely following yet another frightening dip — this time to the mid-$1150’s — as bargain hunters (funds, once again) emerged during the Wednesday session and were able to lift the yellow metal back to above the $1170 level by the time the afternoon session drew to a close. Physical markets continued on the anemic side, especially in Asia. Rising gold scrap sales in the region and falling gold bar premia in Hong Kong and Japan were the stand-out features overnight. Indian buying was once again notably slow despite what the calendar indicates ought to be a festival-related buying period. Bullion ingots were trading at a 50 cent discount in Tokyo overnight as industrial (electronics) demand barely nudged out selling of the metal by retail investors. Thursday morning’s conditions in Europe were anything but cheery as the common currency slumped to a fresh fourteen-month low (@ 1.273) against the US dollar and added to its year-to-date 7.5% loss in value. Analysts continue to believe that gold in euro terms will remain the better ‘performer’ as opposed to dollar-denominated gold, at least in the near-term. Rescue or no rescue, Greece has no funds with which to repay bond redemptions totaling 8.5 billion euros during the current month. Meanwhile, Moody’s alluded to a potential rating cut for Portugal. Quick to the draw, the leaders of France and Germany shot words across the bow of…ratings agencies such as the aforementioned one. Turns out, as usual, when you don’t like the message, you shoot the carrier of same. Allegations were made by Mr. Sarkozy and Ms. Merkel that the downgrade of Greece may have itself precipitated/worsened the crisis. Chalk that one up among one of the more…interesting developments heard lately. Start a war against the watchmen who are supposed to keep an eye on the reactor core and who knows what you may end up with…Against this desolate financial landscape, the ECB was supposed to meet today and decide on interest rates. Correctly, as it turned out following the ECB announcement, no bets existed that the institution will hike rates at this juncture. Some bets existed that some kind of QE or asset purchase programme could be in the works by the same. Of course, such a gesture might only fan the flames of fear of contagion that are currently raging in the Old World. The situation remains on active watch. Not that all is doom and gloom in Europe, really. The regional economy has thus far been able to take the Graeco-Portuguese woes in stride as the two countries amount to but 5% of the zone’s GDP. New York spot metals dealings opened with gains across the price boards we normally track. Gold started off with a $4.00 gain quoted at $1179.50 bid per ounce and notched such a gain while the dollar was still rising on the index (to 84.50). Crude oil was off by a quarter, and was last seen breaching the $80 mark once again, and –at $78.87 marking a two-month low. Dow futures were mainly positive until weak same-store retail reports by Target hit the wires. Sporadic selling waves could still be manifest in the metals complex later on during this session. Yesterday’s battle to recapture the safe-haven mantle and the recent positive correlation to the greenback appear successful thus far. However, participants are now factoring in upcoming days of wide swings and irrational trading patterns as more the future norm than the exception. In essence, all of the planetary alignments necessary for a shot well beyond $1200 have been in place for at least one week now and yet gold still finished yesterday’s session at below last Friday’s levels and now needs further proof that it can withstand buffeting by spec funds in either direction without losing composure. Mind you, no serious threat is seen until and unless the metal breaks $1123 and then $1085 — and even such a potential breach only targets the $950 area initially. On the other hand, a rally in gold past the $1210 area will likely negate any short-term bearish overtones in the market. Those are the parameters in the sights of Elliott Wave analysts, at the moment. EW also points out that while the gains that gold has achieved in euro terms could potentially be interpreted as bullish overall, the reality remains that the yellow metal has not risen to records in all currencies — contrary to bullion bully chatter seen in various forums. A short list of currencies in which gold has not recorded new peaks includes: AUD, NZ$, SFR, SKR, and Singapore $ — and up to very recently — the Canadian Dollar as well. The 10-year spot chart shows a 325% US dollar versus 194% Canadian dollar gain in the metal. Silver was ahead by 9 cents at the start of the session this morning, recapturing some of the sizeable chunk of value it lost over the past two days, and was quoted at $17.59 per ounce. Platinum and palladium also made attempts at righting the price ship, the former with a $15 gain to $1661.00 and the latter climbing by $10 to reach $512.00 the troy ounce. Rhodium remained static at $2750 on the bid side. Chinese buying lifted copper back up to $7085 earlier in the morning. Bargain hunters also emerged in the nickel pits, where the metal suffered a spectacular 15% decline on Wednesday. All eyes now turn to Friday’s payroll data and what risk appetite or aversion the numbers may give rise to. Book-squaring activity will also add to the market’s choppiness tomorrow. Finally, in a possible replay of a by-gone era which shall remain unmentioned, it turns out that when the going gets tough, the rich go…driving. Expensive wheels, that is. As in, collectible autos like a 1930’s vintage Bugatti which sold for $30 million and has now captured the title of the world’s most expensive car. Final note: First-time jobless claims fell 7,000 in the latest reporting week — a third week of declines. Economists are projecting April job gains at around the 185,000 level. Productivity levels in the nonfarm sector rose by 3.6% after having recorded gains at the 6.3% mark during the previous year (the highest in nearly half a century). In addition to bullion 2010 American Silver Eagles that are already available, the United States Mint this year will also issue 5 oz. bullion America the Beautiful Silver Coins that are duplicates of the America the Beautiful Quarters. The first five of the coins will released later this summer. To read about the U.S. locations honored on this year’s coins, check out a sister CoinNews site and its page 2010 America the Beautiful Silver Bullion Coins.